Or on a mountain tall. This journey, this thing called Islam, is simply amazing. My only lament is not being able to articulate it with justice. Despite that shortcoming, I invite any and all seekers to truth to join me on this sojourn. ‘Ubad’s remarks take us back in time to the historical landscape of 7th Century Arabia, to a time when Islam had yet to sink in its roots. In other words, Islam was yet to be seen as a bona fide Arabian religion. All Arabs in the region became “free agents” – they were free to choose their religious affiliation without fear of reprisal, but most importantly, without fear of losing their cultural identity [i.e., their Arab’ness]. everything around it, Islam was coming to the Ka’abah not as the exclusive religion in Arabia, but one amongst many. This had the effect of breaking down social and psychological barriers between being an Arab, and being a Muslim. There is a great deal of wisdom for us to take from this – not just simply learning these facts as history lessons. We need to break down these same barriers of American and Muslim. We must remove the space and join the words, even if only with a hyphen [see Greco‐Roman]. “Habit! That skillful but very slow housekeeper who begins by letting our mind suffer for weeks in temporary arrangement; but whom we are nevertheless truly happy to discover, for without habit our mind, reduced to no more than its own resources, would be powerless to make a lodging habitable.” [Swann’s Way]. 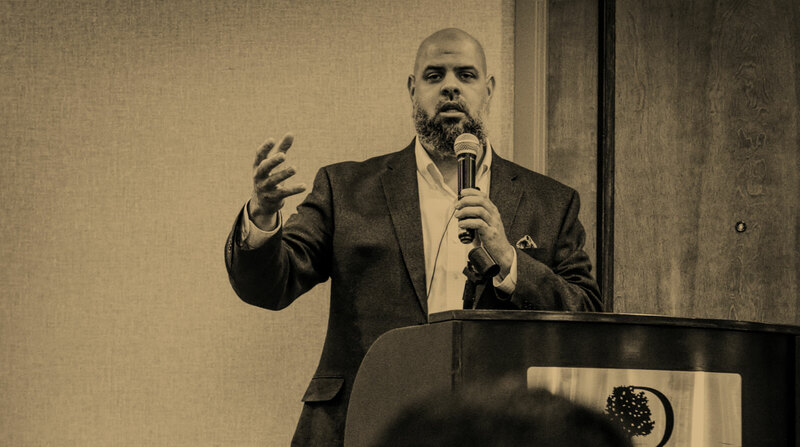 Without establishing this sense of Muslim habit, I believe Muslims will continue to suffer and fall prey to a variety of maladies, not the least of which is already prevalent in our community: Double-Consciousness. Muslims have been looking at themselves from another one’s eyes for quite some time now. We see it manifest quite often nowadays in so‐called Muslim reformers, who, incapable of seeing themselves for who they are, proffer up an articulation of Islam that is not, at its center, an attempt to please God, but a vain attempt to appease the dominant culture. How will Muslims deal with this? social, political and moral landscape? This leaves Muslims on a very precarious precipice: that of secularism and positivism. In fact, if Muslims are not careful, I fear we will either turn 9/11 or have it turned upon us as a sort of secular holiday, where our reflection on the nature of the event is only seen in a “worldly” context – mainly to appease the dominant cultures stance of Muslims [as well as our own psychological insecurities], especially psychologically. The idea of standing firm here is not the one for the sake of being obstinate or dominant, but because ultimately, there are some aspects of Islam that are immutable. Like a tree, whose roots must remain firmly planted for the life‐sake of the tree, its branches are free to grow where they need to in order to perform their function. However, they always are attached to the life giving roots of the tree. This is akin to how the Shari’ah operates. any knowledge, gained or inherited, must pass through the sieve of secularism or positivism, including such spheres as legal, logical, and scientific, whereupon only if Islam’s transcendent values can be brought down and in line with the latter, can the position that Islam holds be deemed valid [i.e., universal, scientific, etc.]. This is killing us, intellectually speaking. First and foremost because this kind of rhetoric is at its heart a true bid’ah, as it seeks to compete and oust the Sunnah and the Shari’ah. And the proof is in the pudding: how many Muslims, especially those coming from ethnic Muslim backgrounds, pursue anything other than law, medicine or some type of science? What we could call the humanities in the West, are left to the dregs of academic and intellectually inferior students. How can we run a community when the best and brightest only student chemistry, law, and medicine? We have stunted our growth, have cut ourselves off and made ourselves very remote from the world. What was once a major study for Muslims, cosmology, has been reduced to a horizontal plane: the Cosmos is a horizontal one. We never look up, or worse yet, inwards. Forever gazing out, we cannot see the forest for the trees. We must re‐attach ourselves to the Sacred – to Allah, to His Book, to His Prophet [s], learning his ways, his wont, his attitude, not simply a loose collection of ahadith to be branded about like a blunt instrument. It is not enough to profess faith to be doing the right and responsible thing, but it is that our actions fall in line with what we believe. and in self‐delusion that veils the hearts. Provide for us, for you are the Best of providers. be upon our master, Muhammad.